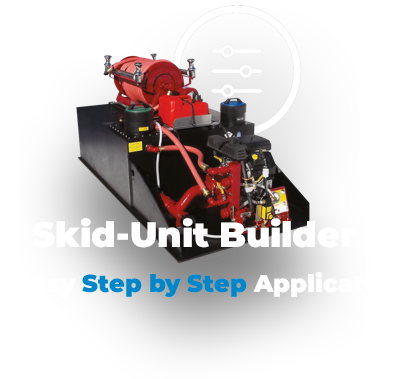 A tank, a live hose reel, crosslay, foam system(s), and or patient transport, with a fire pump that can be combined into a single one-piece assembly slipped onto a small truck, ATV, trailer or boat. 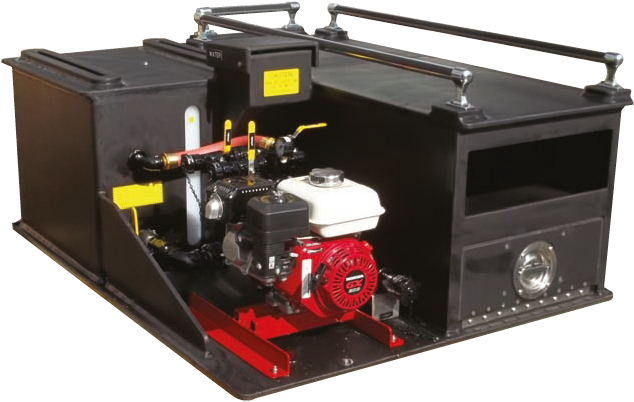 This unit can be used for flowing water and or foam on a structural fire, car fire, marine fire, wildfire, and confined space fires. This unit is very effective for garages, commercial and industrial buildings, stadiums, arenas and parking lots. The combination of fire suppression and patient transport capabilities, packs a lot of value into this all poly-unit. It’s “light” and ready to “fight”. The water tank shall be constructed of 1/2” thick polypropylene sheet stock with PolymarCoPP(tm) resin. Water tank shall be welded with Heavy Duty extruded joint. The material shall be of a certified, high quality, non-corrosive, stress relieved thermo plastic, black in colour with a textured finish, and UV stabilized for maximum protection. The skid type water tank shall be of a standard configuration and shall be so designed to have complete modular slide in capability. The unit shall incorporate transverse partitions manufactured for 3/8” PT2E polypropylene which shall interlock with a series of longitudinal partitions constructed of 3/8” PT2E polypropylene. All swash partitions shall be so designed to allow for maximum water and air flow between compartments and are fully welded to each other as well as to the inside of the tank. The driver side rear wall of the tank shall have a standard built in sight gauge 3” in width, and 70% transparent. The tank shall be equipped with a combination vent/overflow and manual fill tower. The fill tower shall have a 8” x 8” x 8” square hinged type cover. The tower shall be located in the right rear corner of the tank. There shall be a vent / overflow installed inside and to the extreme rear of the tower approximately 2” down from the top. This vent / overflow shall be of a standard schedule 40 polypropylene pipe with minimum ID of 3”. The vent / overflow shall be piped internally toward the front and exit out the front tank wall with a 1/2” extension past the front tank wall. The tank cover shall be constructed of 1/2” thick PT2E polypropylene, black in color, UV stabilized. The tank shall have a capacity of 75 U.S. gallons of water. The floor of the tank shall be manufactured from 3/4” PT2E polypropylene. There shall be one (1) sump as standard per tank. The sump shall be integral to the tank floor and be a minimum of 3/8” deep recessed into the floor. The sump shall not be visible from or protrude through the bottom of the tank. There shall be two standard tank outlets located in the same vertical plane on the driver side rear wall of the tank. One (1) 1-1/2” female NPT tank to pump suction fitting and one (1) 1” female NPT tank fill fitting with flow deflector. There shall be a 1” tank drain to the rear side of the tank with a brass plug. The cover shall incorporate two (2) booster reel mounting blocks that shall accommodate two (2) each sliding nut fasteners. These 4” large mounting blocks shall be welded to the covers running from the rear edge of the tank forward to the front edge. There shall be a full width skid base manufactured of 3/4” PT2E polypropylene welded to the tank. This base shall be 48” wide by 54” long. Tank will be baffled in accordance with latest NFPA requirements. The unit shall be equipped with a stoke basket area with stoke basket fixation system. Under the stoke basket area it shall have an open storage compartment. Under the stoke basket area it shall have an enclosed storage compartment as well with a heavy duty “D” type handle. The pump shall be a CET DI-PFP-6hpHND-M-Twin two (2) stage centrifugal pump, bolted directly to the engine, with a 1.5” NPT suction inlet, two (2) 1” NPT discharge outlets and one (1) 1.5” NPT discharge outlet. The pump piping shall be flexible to prevent any breakage caused by vibration. The pump shall be capable of a maximum discharge volume of 70 GPM. at 10 PSI, and a maximum discharge pressure of 125 PSI while pumping 20 GPM. In the center of the performance curve, the pump shall be capable of pumping 40 GPM at 100 PSI. The pump shall be driven by a 4-stroke Honda gasoline powered, 6.5 horsepower single cylinder engine. The engine shall be air cooled with a recoil rope starting system. The engine shall be fueled from a 1.5 gallon fuel tank which is to be mounted on the engine. The engine shall be connected with a quick disconnect weather proof style connection. 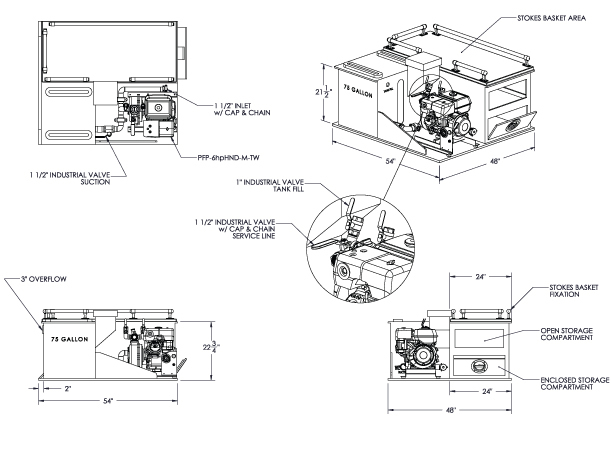 The pump engine shall be equipped with a self priming system capable of 10’ - 15’ lift for fast positive priming. All piping on the suction side shall be made of steel (welded joints) schedule 40. The suction piping, the pump and the discharge shall be tested to 400 PSI. The suction piping shall consist of a 1.5” tank to pump line with a 1.5” flexible rubber hump hose to minimize flex and vibration between the pump and the tank. Between the tank and the pump there shall be a 1.5” industrial valve. This valve shall remain open to pump from the tank. This pipe shall have a tee into the suction side of the pump, and shall continue to the rear of the truck for overboard suction. The overboard suction connection shall have a 1.5” NST male adapter and a 1.5” NSTF cap with retaining cable. Other openings will be utilized accordingly when pre-connects, booster reels and other accessories that require pressurized water are specified. All valves larger than 1” shall be a fire service type drop out style ball valve which shall have a hard-coated anodized, high-strength, light-weight aluminum alloy body with rugged stainless steel ball and two PTFE seats. The valves shall be capable of bi-directional flow with a minimum working pressure rating of 250 psig. All stainless steel parts shall be made from 300 series material. The valves shall NOT require lubrication of the seats or any other internal waterway component and shall be capable of swinging out of the attached waterway plumbing for easy maintenance, with the removal of six (6) to eight (8) bolts. Any required valve 1” or smaller, unless otherwise specified, shall be a standard plumbing style industrial ball valve. A 1’’ and a 1 1/2” industrial valves drop out style with handle and 1 1/2” NSTM threads shall be furnished with a cap and chain. There shall be one (1) 1” Industrial Ball valve plumbed via high pressure hose from the manifold to the Tank Fill inlet noted on the tank for the purpose of filling the tank and re-circulating water during stagnant pump operations.